For the last eight years, Trish Delancourte has been trying to put the past behind her. The only survivor of a psychotic madman, she's moved to the small town of Serenity, North Carolina hoping for a fresh start. But upon her arrival, a woman is found murdered, a young boy shows up on her doorstep, and she meets the Randolph brothers. 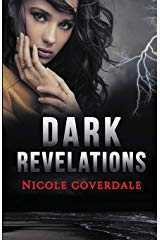 The oldest of the five, Cameron, intrigues her more than anyone ever has before, but she's scared to open her heart up. Everyone who she's let close to her has either died or betrayed her. Will she be able to put her past behind her... before it's too late?